Learn How to Set Up ESlint, Airbnb’s Style Guides, & Prettier using a Create-React-App without ejecting and Integrate ESlint With Your Editor. Prettier is another open source library of opinionated linting rules, much like Airbnb’s. While Airbnb’s style guide is concerned with code quality and potential run time errors, however, Prettier takes care of more aesthetic code style decisions like indentation, new lines, and when to use semicolons. While this may seem overly nit-picky at first, it’s actually liberating because it alleviates the need to make a lot of trivial decisions, allowing developers to devote that energy to the functionality of their code and not how it looks. It also guarantees consistency across entire projects. React is an open source library for building user interfaces, released and maintained by Facebook. Create React App (CRA) is a convenient command line tool, also maintained by Facebook, that makes it easy to, well, create a React app. Yarn – Npm will suffice I’ll be using Yarn for examples. *If you’re using Yarn, make sure your yarn install directory is in your path for globally installed packages. Great, our app is up and running; now we can add ESlint. 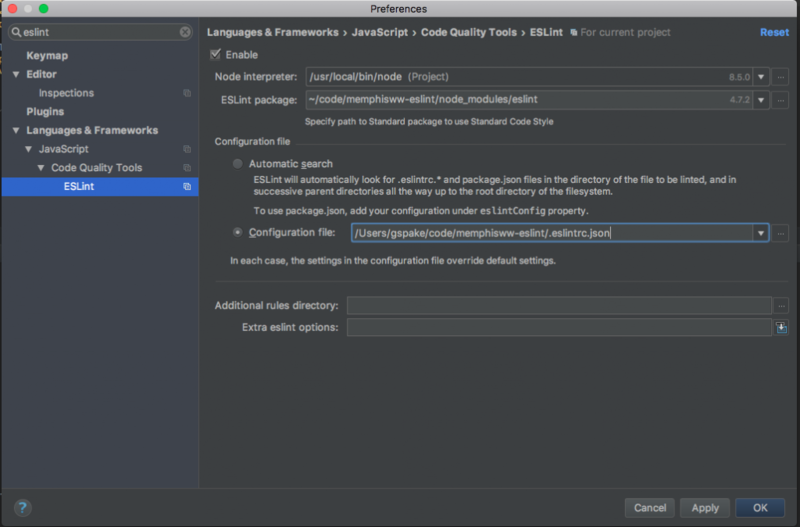 You should see ESlint appear in the dev dependencies section of your package.json file. With ESlint installed, we can use the handy init command to set up the inital ESlint configuration for our project. This command will launch a walk-through that will set up your ESlint configuration automatically by asking a few questions? Cool! we’re all set. You should see some new dev dependencies in your package.json file and there will be a .eslintrc.json file in your project directory. Let’s run ESlint against our code directory. Nice; We’re linting! We’re getting lots of errors but that’s what we want. That command still looks pretty funky, though, so let’s add a script for it to our package.json file. Scripts in package.json will reference the node_modules directory before your computer’s $PATH so there’s need to include the full path in the command. This will allow us to use yarn to run$ yarn lint with the same results as before. Right away, ESLint tells us that there are 37 problems along with a description and some info about where to find them. 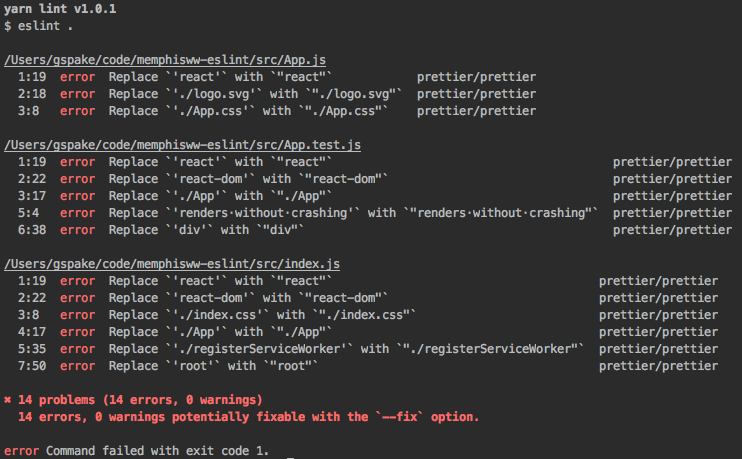 One of the files ESlint is warning us about is registerServiceWorker.js, which comes with create-react-app and we probably won’t be messing with. In some cases, like this one, we’ll want to tell ESlint to ignore certain files completely. To do so, we’ll need to create a file named .eslintignore in the root directory, add src/registerServiceWorker.js to the first line and save. When we run yarn lint again, we’ll notice that that file is excluded from ESlint results and we’re down to just seven problems! Note: Ignoring files is a brute-force solution to linting errors and, if abused, defeats the purpose of using a linter. Make sure that if you ignore files, you have a good reason. There’s no need to add node_modules to your ignore file because ESlint is smart enough to ignore it by default. Next we can see that each of our files is getting that react/jsx-filename-extension error. A quick search tells us that this is because files that contain React’s JSX syntax should have a .jsx file extension. The easiest way to fix this would be to just change our file extensions but I don’t like that idea and Dan Abramov doesn’t either so I’d rather tell my linter that I want to use .js file extensions. No problem! To fix this I’m just going to add a rules section to my .eslintrc.json file, and specify that I want to use ".js"
Now if we run yarn lint again, we’re down to just four errors. If we run yarn lint, we’ll see we’re down to just one error. and this one will require us to refactor some code. Here’s where we start to see the value of these tools. So far, we’ve mostly just told our linter to be quiet because we know what we’re doing but now we’ve reached a point where we actually need to fix some code. Stateless functional components are simpler than class based components and will benefit from future React performance optimizations specific to these components. 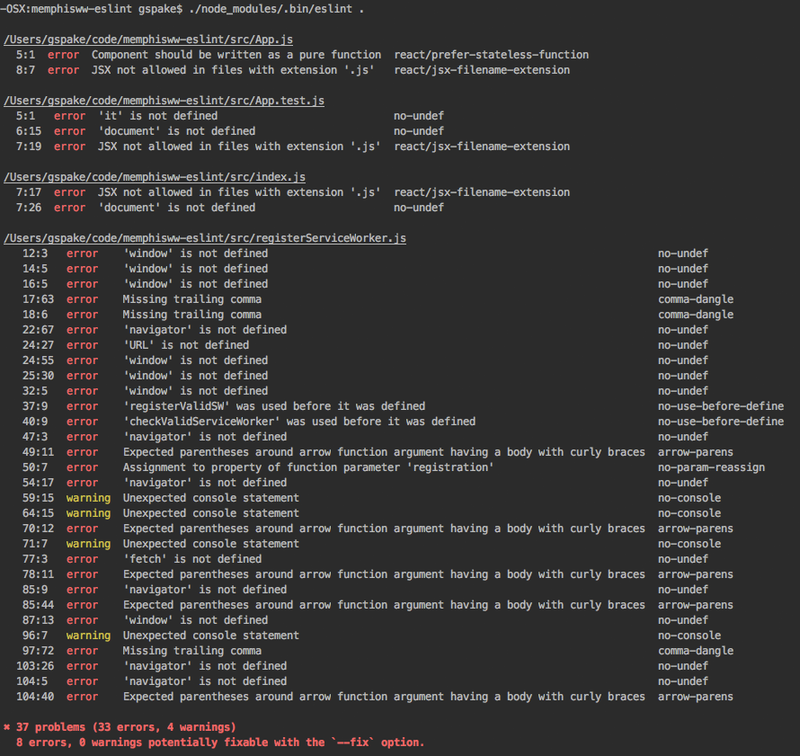 Here’s what it looks like once we’ve refactored it based on the plugin documentation. Dang. Now we have more errors. But, by now, we know what we’re doing so we’ve got this. These new errors are all related to the fact that we are no longer using the Component import, so removing that will clear up a few of them up. 1 error, 0 warnings potentially fixable with the `–fix` option. I chose to keep these scripts separate, rather than including it in my main lint script, because I like to see errors before fixing them. This time, I’ll run yarn lintfix and it will fix the error for us automatically! So far, we’ve set up eslint with the Airbnb styleguide rules, added some npm scripts to check our code, and fixed some errors by configuring ESlint and refactoring our code. Now let’s bring in Prettier. Cool! Now we’re getting Prettier errors. This time, prettier is griping at us about single quotes – it wants us to use double quotes – and, once again, it looks like we can fix all of these errors by running our eslintfix command. Since Prettier is mostly concerned with style, you’ll find that most Prettier errors can be fixed automatically. I like single quotes, though, and I want to override this particular rule and enforce single quotes instead. That means we get to update our eslintconfig.json file again. I’ve added `”singleQuote”: true` to my Prettier rules so now Prettier will actually enforce single quotes. This is a great example of using your linter to enforce your own preferences. The preference itself is not as important as ensuring all of the project’s code conforms to the same rules regardless of who’s writing it. Since we’ve fixed all of our errors, it’s not going to do much for us now, but let’s see what happens when we mess some stuff up deliberately. In the gif below, I’ve added some unnecessary whitespace and replaced some double quotes with single quotes. Since we’ve made the IDE aware of our ESlint rules, it will highlight violations for us and display details about the error on hover. I can also right click and choose “Fix ESlint Problems” to fix them automatically. Pressing alt+enter on an error will provide even more options, including the ability to suppress certain errors in a specific file, which adds a comment to the top of your file automatically to silence it. Now that you’re an ESlint pro, use it! Try linting some code you’ve already written and see what happens; chances are you’ll find some things you can improve and maybe even some potential bugs. Working on a project with multiple developers? Enforce compliance with linting rules by rejecting commits that fail. One final thought. Linting may seem like an unnecessary and burdensome requirement on top of all of the other challenges associated with writing code but the perceived hassle is most definitely worth the benefits. Your linter is your friend that’s always watching your back and helping you catch mistakes; it’s like pair programming for free. Sometimes you might disagree but, remember, ESlint is completely configurable – it’s designed to enforce your preferences, not give you a hard time so if you don’t like something, change it. The feeling you get from writing code that lints is rewarding and I encourage everyone to make it a habit.